Comet ISON: Live video chat with NASA scientists. 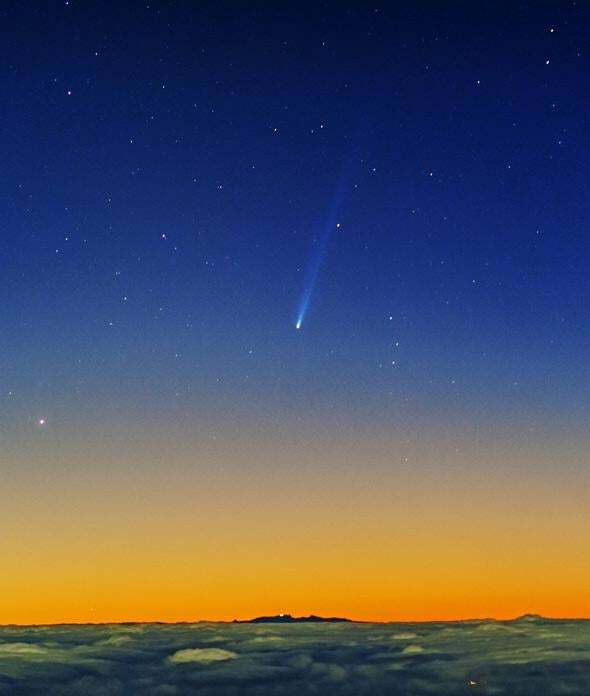 Comet ISON over the Canary Islands, taken from Tenerife on Nov. 21, 2013. Click to embiggen. On Thanksgiving Day — Nov. 28, 2013 — the showy comet C/2012 S1 (ISON) will scream past the surface of the Sun, skimming over the roiling surface of our star at a height of just 1.1 million kilometers (700,000 miles). We don’t know if the comet will shine mightily, blast off chunks of itself, or disintegrate completely during this close encounter. But you can watch the whole thing live, with me, and a pile of NASA scientists on Google+! NASA is holding a live video Hangout on G+ during ISON’s perihelion passage (peri = close, helion = Sun, so perihelion is the closest point in an object’s orbit to the Sun). The event is from 18:00 – 20:30 UTC (1:00 – 3:30 p.m. EST). There will be live feed from NASA’s SOHO Sun-observing satellite (that should be spectacular) and from the Kitt Peak Observatory solar telescope. Guests include astronomers C. Alex Young, W. Dean Pesnell, Karl Battams (who runs the SunGrazingComets feed on Twitter), and me! I’ll be on from 1:30 – 2:30 EST to talk about the comet, the Sun, and what we’ll be seeing on the screen. We’ll also be answering questions live from Twitter; ask away using the hashtags #ISON and #askNASA. You don’t have to have a G+ account to watch; on Thursday I’ll put up a post with a video viewer embedded in it so everyone can watch from there (assuming you can tear yourself away from football, or eating turkey, or the MST3k Turkey Day Marathon, or all three). After all, Thanksgiving comes every year, but a bright, ostentatious comet taking a death-dive into a star’s atmosphere isn’t something that happens terribly often. I hope y’all can take some time to check it out.